We want to build the widest possible coalition of forces to campaign for action on climate change. Involving trade unions is an important part of this. Whether you are a member of a union or not, you can help - new guide to engaging unions. 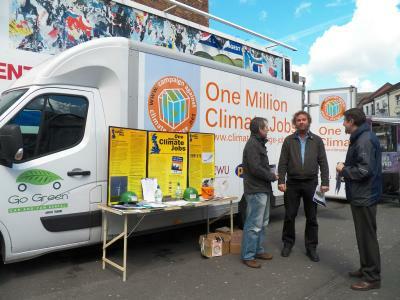 The One Million Climate Jobs campaign was set up by trade unionists within the Campaign against Climate Change, and is supported by eight national unions, including PCS, CWU, UCU and TSSA. 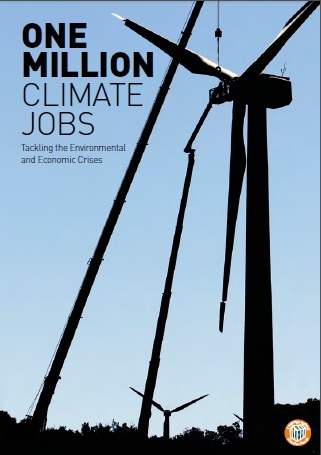 The One Million Climate Jobs report sets out the work that needs to be done in the transition to a low carbon economy fit for the future. It received inspiration from the struggle of workers at the Vestas wind turbine factory on the Isle of Wight, who occupied their factory when it was slated for closure in mid 2009. New report launched September 2014 - available to read online or buy. 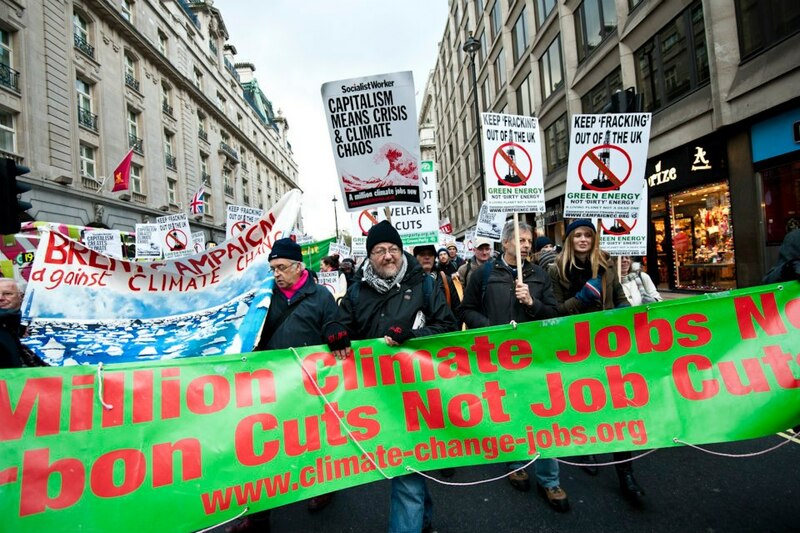 We face a climate crisis and a crisis of pay and employment for millions of working people - but there is an alternative. Unless decisive action is taken in the next few years, climate change will become irreversible and catastrophic. Already droughts and more intense hurricanes and typhoons are affecting communities around the world and pose the prospect of rising food prices and the greater risk of flooding for us in Britain. But politicians dither and consistently refuse to reach a binding international agreement on reducing emissions. At the same time working people are paying the price for an economic crisis they did not cause by suffering job insecurity and reduced income levels. Just under two million people are unemployed - a million of them young people. Currently, only 1 in 40 new employee jobs are on secure full-time contracts. Low pay, unemployment and benefit cuts mean that a million families in Britain have to choose between heating their homes adequately in winter or having regular meals. We can create a million secure Government jobs in renewable energy, in increasing energy efficiency by insulating homes and public buildings free of charge, in hugely expanding cheap public transport to get people and freight onto cleaner forms of transit, and in developing the "green skills" that we need through education and training. A million decently paid Government jobs, and the spin-off of half a million additional jobs that this would create, could kick-start the economy. 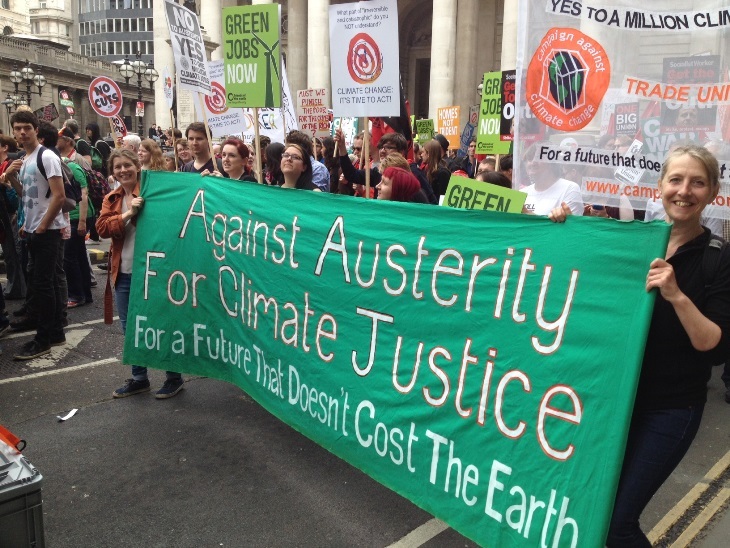 It is the alternative both to austerity and to Government inaction as the world slides towards climate catastrophe. On Monday 23rd May, 2016, North Yorkshire County Council approved Third Energy’s application to do test fracking (hydraulic fracturing) for shale gas at Kirby Misperton in Ryedale. This was in spite of receiving 4,375 letters of objection from local residents- and only 36 letters in support of it. The UK has a vast potential for clean energy. 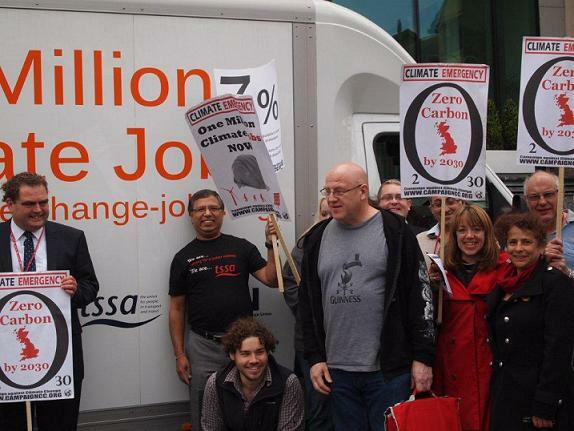 Investment in renewable energy, public transport and energy efficiency (as outlined in the ‘One Million Climate Jobs’ pamphlet) will create far more jobs than fracking, deliver energy security, boost our economy and allow us to play our part in avoiding dangerous climate change. Click here to read more about the trade unions opposing fracking, and their reasons for not supporting it. The impacts of climate change are already upon us. We don't have to look hard to see the devastation that has taken hold on peoples lives and the environment across the globe, from bleached coral reefs to wildfires in Canada, from melting Arctic ice to droughts in southern Africa, rapidly rising temperatures are taking their toll. In the UK, the effects of climate change have not reached our shores so severely yet. But, if it is not taken seriously, the effects will be catastrophic. Responding appropriately to the climate crisis upon us will open the gateway for hundreds of thousands of green jobs. Tackling climate change at the root through greening the economy is a direct and positive way in which climate activism and job provision meet. As ever we are strengthening Union affiliations through networking events, conferences and communication. If you are already affiliated or want to be then get in touch to organise a representative to attend an event.